Yet another beautifully simple dish inspired by Tyler Florence’s book, Start Fresh (I very loosely followed the recipe). I’d recommend this book to anyone who likes cooking, but especially those who are cooking for babies or toddlers and desiring to show them a variety of foods at an early age. I was talking to a friend just last night who said that because of the picky way she ate when she was little, she has such a hard time trying new foods as an adult. Consequently, she is sure she hates cauliflower but is going to try it for the first time this week. Hooray! There are many ways to enjoy new vegetables and one of the best ways is by roasting them. So simple, so fresh and brings out a whole host of flavors you won’t get by steaming or boiling. This recipe calls for kale, onion and bacon to roast together in the oven. 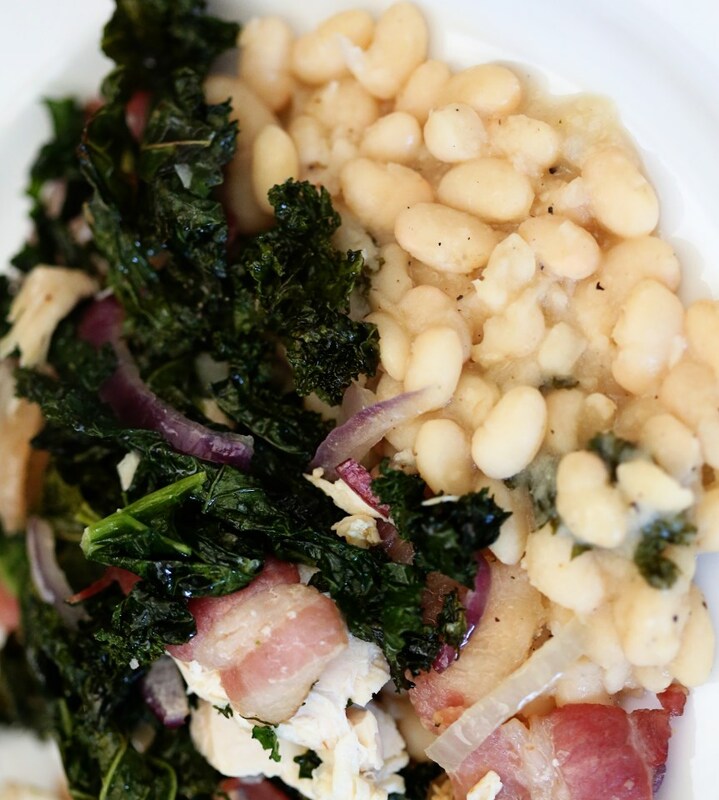 The kale gets super crispy and the bacon adds enough fat to take the dish to comfort-food level. If I were feeding this to a baby, I’d simply take a bit of each component and blend it up with a little water or stock! It’s totally easy to let the babies eat what you eat – just cook good food for YOU and blend it or mash it up for THEM! This is the essence of Start Fresh and if you want an all-inclusive book for babies through toddler years and older, this is the book for you! On a baking sheet, arrange the kale, bacon, shallot and pine nuts and bake at 350F until the bacon is crisp, about 25 minutes. Stir a few times as it bakes to ensure nothing burns and the bacon cooks evenly. In a medium saucepan, heat the olive oil and crush the clove of garlic and add to the oil and when it begins to sizzle and turn brown, add the beans and stir to combine, add the stock and reduce the heat to low and let the beans simmer. Salt and pepper the beans to taste and discard the garlic clove. 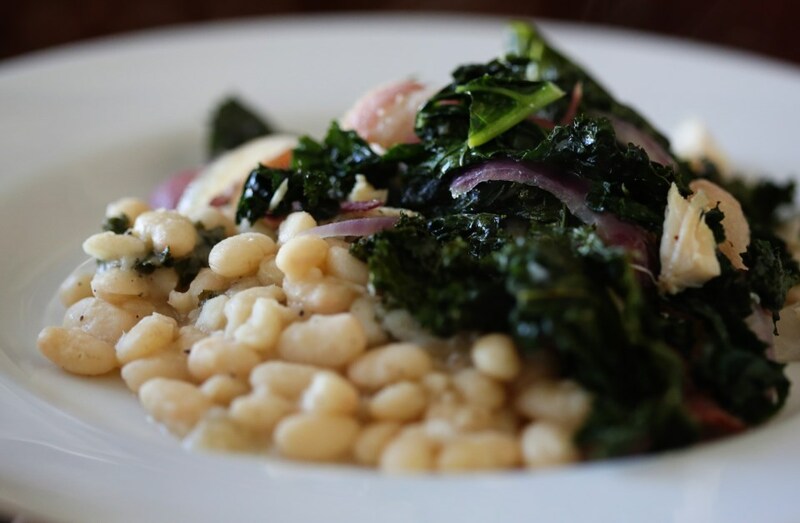 Serve the beans with the kale mixture on top and enjoy! *inspired by a recipe from Start Fresh. He made a risotto and I used beans 🙂 Work with what you have! I received several requests for kale recipes when I asked a couple weeks ago for ideas for this blog. I wanted to do something a little more challenging or interesting than the typical things you see for kale in the sea of Pinterest such as kale chips, kale salads, wilted kale, etc. Basically, all the things you could use spinach for, if you were less ambitious. I’m still not altogether familiar with kale’s flavor profile, but after turning a big bunch of it into creamy, soul-satisfying Indian food, I’m dedicated to finding ways to use this super food. One of our favorite things to order at our local Indian restaurant is spinach paneer. 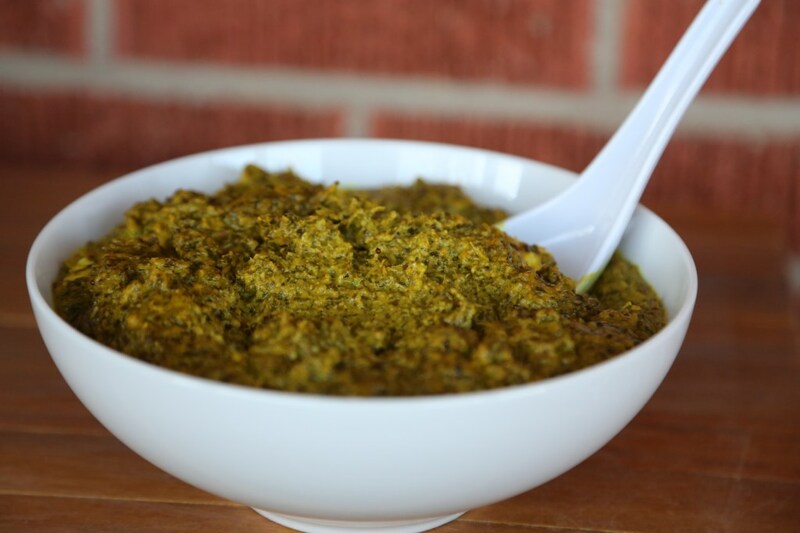 Creamy spinach with warm cubes of Indian cheese that doesn’t melt, but spreads wonderfully on a piece of garlic naan. Truly a comfort food. I saw this recipe for kale paneer and so I decided to try it for myself. This girl calls for making a cream by boiling a cup of cashews soaked in hot water. That sounded like a vegan move and I didn’t really want to buy a cup of cashews (hello, expensive) so I just subbed in heavy cream, which I always seem to have on hand, and it turned out wonderful. I also decided after tasting it that the cashews would have added a certain sweetness, so I added in two tablespoons of brown sugar and it was the right move – just enough sweetness to offset the bitterness of the kale and all the spices and it mellowed everything out really well. For all of you who were wishing I’d do something a little more healthy with kale, like I said; there’s always next time. But especially on this snowy day (wha?!) I think this recipe fits the bill. If you lack the myriad of spices this recipe calls for, (I had them all! Proud moment) don’t waste your money at a regular grocery store. Please go to Ghandi Bazar if you live in Lubbock, (or come to my house; seriously) and if you live elsewhere, I’m sure you can find an Indian market on some back street in your own town. They know their spices and they’re cheaper than you’d EVER find at a chain grocery store. Oh, and I didn’t go to Ghandi Bazar to find the paneer. I was at United and looked up that Queso Blanco (or queso fresco) is very similar to paneer as it won’t melt and has very similar flavors. It turned out great and got better with each day! Roughly chop the onion, garlic, and ginger. Heat a large pot over low-medium heat, add oil, then the onion, garlic, and ginger. Saute over low-medium heat until the onions begin to brown, at least 5 minutes. Once browned, add all of the spices and saute for another 1 or 2 minutes. Add the chopped kale to the pot and saute until bright green. Add the heavy cream to the kale mixture along with the yogurt and brown sugar, and stir in. Begin pureeing the curry with an immersion blender (or in batches in the regular blender) until smooth and no lumps remain, then transfer to a large bowl. Once the entire curry has been pureed continue to cook over low heat, stirring occasionally. Slice the cheese into small cubes and add to the simmering curry. Keep cooking, uncovered, stirring occasionally, until the curry thickens. If you prefer a thinner sauce, or you find the curry has gotten too thick, just add more water until it reaches your desired consistency. Season with salt, to taste, and more brown sugar, if necessary.